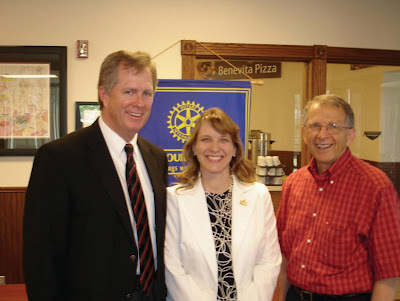 State Treasurer Dennis McKinney spoke to the Concordia Rotary Club and guests at the weekly Rotary Meeting held at Cloud County Community College on May 22, 2009. Representatives Vern Swanson from Clay Center and Elaine Bowers, Concordia also attended. Among Treasurer McKinney’s topics included the Kansas Unclaimed Property held at his office. The website is www.kansascash.com or to be assisted by his staff call 800-432-0386 or email the Topeka office - unclaimed@treasurer.state.ks.us There is no fee to withdrawal funds or bank safety box deposit items if you find your name on the Treasurer’s website.